Phottix have released their much anticipated entry into the ETTL and remote manual trigger market with the Odin TTL trigger. Phottix have previously delivered one of the best Manual trigger options available for speedlights in the Strato II triggers, so expectations where high with the TTL Odin and they have certainly delivered again. UPDATE – The Phottix Odin TTL triggers are now also compatible with the Phottix Mitros + flash unit, which have Odin radio transceiver unit built directly into the flash ! UPDATE – Compatible with Phottix Mitros + with built in Odin transceiver. Full control through the one simple Odin transmitter interface, this is really the standout feature of the Odins. Most importantly they work flawlessly with plenty of range and no misfires or radio interference issues. Manual and ETTL can be used and combined together at the same time, in 3 different groups. Compatible with all Canon ETTL II camera bodies from the 20D onwards, no special flash control menus required. HSS (high speed sync, up to 1/8000th), Second Curtain Sync, and FEL (Flash exposure lock) works. Remote Control of the Flash Zoom Head, in Manual or Auto (auto follows the lense zoom length). Over Drive Sync – high sync speeds with studio lights, with adjustable timing. Firmware updates via built-in USB ports. 1/3rd stop manual power adjustment, even for 550ex, 430ex & 420ex flashes which usually do not support this. TTL compatibility currently only with Canon, Phottix and some Nissin flash units. Not YongNuo or Sigma etc. It’s no secret I’ve been a big fan of the Phottix Strato II manual radio triggers, so I’ve been keen to find out what the new Odin TTL triggers are like. I watched the video and read some reviews but the one thing that still didn’t strike me until I actually had the Odin in my hands is just how incredibly simple they actually are! 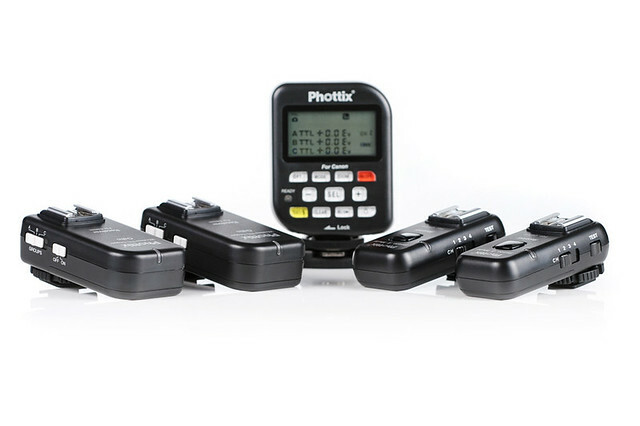 This is a powerful system with the ability to combine mixed ETTL and remote manual groups at the same time, but Phottix have made this all seem very simple smooth to operate. And they really are very simple to use, the Odin are the plug and play simple PocketWizard Control TL would have liked to be. When the Odin first arrived I didn’t have a chance to read the manual (provided on CD), so I had a quick play with the transmitter unit on its own. That’s when I realised you really don’t even need an instruction manual to learn how to operate these, its so obvious and intuitive by the time you get to the manual there’s really not that much left to learn (and the manual is very short and to the point anyway which I like). No need to set up configurations through software on your computer like PocketWizards, and adjust for different camera models etc. Just slot them straight on to any ETTL II camera and you’re away. NOTE – One simple thing that does catch people out quite often, is simply knowing that the flash units must be set to TTL for the Odin to work (even if just using manual power levels). The main reason the Odin are so easy to use it that everything is controlled by the one simple transmitter unit (TCU), which has the great Nikon style interface with all groups displayed on the LCD at once. And the buttons are virtually all dedicated to just one purpose, so it may look a little complex at first, but it’s really exactly the opposite and very simple and intuitive. No digging through layers of menus either. Your thumb naturally finds the centre SEL button, and that is all that’s needed to scroll through the 3 groups, pressing the + & – to adjust them and MODE to change from ETTL to Manual, or Off. That’s all there is too it. In ETTL settings there are + or – 3 stops of exposure compensation, but that is also added to the exposure compensation set directly on the camera. So you actually have up to 5 or 6 stops of adjustment either way, which is huge! Set the individual groups exposure compensation on the transmitter and adjust them all up and down globally via the cameras exposure compensation. Manual setting is by 1/3rd stops from 1/128 to 1/1. The receivers are also very easy to set, simply adjust the channel and group switch as required. The On/Off switch is also easy to access. At this point I should probably carry on about switches, standard plug sockets, neat solid hotshoes, great locking rings, battery doors that work, and all that boring stuff that should just be right anyway. But I don’t really have to because Phottix have already gotten these basic design elements right from a long while back (while many other companies are still just starting to catch up). Really well! I haven’t had a hint of misfire or miscommunication. The TTL exposures are exactly as they should be and the combination of manual and TTL flashes working together is seamless. The communication is very smooth, you would hardly know it was happening. As others have mentioned the Odin feel like they are part of the Canon system. HSS and Second Curtain Sync work just as if the flash was on camera. The HSS makes wide apertures and nice Bokeh fast and simple, no messing around taking ND filters on and off while on the go. Remote flash zoom allows you to set each group from the TCU, to either follow the lense like on camera, or set to manual zoom. (Note – you do loose remote control when the flash head is tilted upwards). Flash exposure lock FEL works, which I find great with off camera TTL. Remote manual power setting really saves a lot of time setting up and tweaking. If you’re thinking you only shoot manual so you don’t really need TTL triggers, once you give this a try you might be surprised. It’s hard to go back. This makes the Odin system even greater value because you can trigger your manual monolights or speedlights as well, and very reliably with $50 Strato II receivers instead of needing another full TTL receiver. This also shows Phottix have commitment to forward and backward compatibility. Which is an important feature to look out for in a trigger system, unless you want to be constantly clearing out your current system every time something new comes along. Instead of possibly building on what you already have. UPDATE – 22 Aug 2012 – The Odin are now also compatible with the newly released Phottix Atlas II long range manual triggers (transceivers). The Odin work on the 2.4GHz system so they don’t suffer from the unfortunate RF noise issues and reduced range some PocketWizard Control TL users have had to deal with, particularly with the Canon 580exII. In basic trials the maximum range is clearly a long way, up to the specs 100m region in straight line of sight. Well beyond practical use in TTL anyway. Through a number of walls etc they have no issues so far. Update – The Odin have been one of the most reliable TTL triggers available. Its not uncommon to need a quick reset with many TTL triggers as they have slight hiccups with miscumuniction etc at times, but the Odin’s rarely have any issues like this. The great thing about the Odin’s self contained TCU is you don’t need the latest camera body with flash control menus or MK II flashes to get full functionality. Now also Phottix’s own very good (and well priced) Mitros Flash units. UPDATE – and Mitros + with built in Odin transceiver. Nissin Di866 II & Di622 II also compatible with Canon Odin. YongNuo ETTL flashes (some reports of the YN-565ex working with the Nikon Odins). Note – Most flashes can be fired by the Odin as a basic manual flash, the compatibility listed here is for the complete TTL and remote manual power setting functions etc. This is another area I really like the simplicity of the Odin. Because they use traditional separate Tx and Rx there is no TTL contact foot on the receiver like the PocketWizard TT5. So mounting is very simple via the strong threaded mounting hole. On the PocketWizard the hole is offset from the flash foot and mounting in various modifiers can often be a challenge. The best way to mount the receivers securely is by the threaded mounting hole. So if mounting to an umbrella swivel its best to use the type which have a brass stud in the top, which screws to the receiver. Clamping the plastic feet into coldshoes can easily lead to broken receiver feet otherwise. Pressing the Test button on the transmitter will cause the flashes in A, B and C groups to fire simultaneously. Group(s) turned off will not fire. When the flashes in A, B and C groups are set to Manual (M) mode, pressing the Test button on the transmitter will cause the flashes to fire an initial low-power pre-flash. The flashes will fire simultaneously at their set manual power levels 2.5s later. This feature allows for light meters to be used correctly. So many Sekonic light meters can be set to measure the brightest flash after the initial pre-flash. If a lightmeter doesn’t have that feature you could simply block the sensor for the pre-flash and allow it to see the main flash for a reading. – The Odin TCU Test fire button only used a small flash pulse to indicate the flash units will fire, and not a correct power level corresponding to the power the flash is set to. So a light meter previously could not be used with the Odin Test fire button. – The Odin puts out a small pre flash even in remote manual use. So even using the camera shutter (taking an image) could still be an issue if the light meter does not ignore pre-flashes. With firmware updates from August 2013 the Phottix Odin TTL triggers for Canon and Nikon have a great feature called Over Drive Sync, or ODS. ODS is a fast and simple (but also very precise) timing adjustment, allowing you to tune in the best results possible when using higher sync speeds with studio lights. Adjustments are made quickly and easily directly on the Odin transmitter interface. ODS relies on flash units with long flash durations, and also what is known as an early Pre-Sync firing signal. The early Pre-Sync signal fires the flash before the camera shutter has started to open, and the long tail of light (or long duration) acts like a constant light source, lighting the full image while the shutters are passing over. Most TTL triggers now provide this Pre-Sync firing signal, but the timing is fixed, and results can then be much more limited without any adjustment possible. Accessing the new ODS timing adjustment is just a simple matter of holding down the “MODE” and “+” buttons at the same time for 2 seconds. The ODS screen will display with a default setting of 0.0. There are 50 graduations from 0.0 to 5.0. Each 0.1 is one millisecond. So adjustment range is simply from zero to 50 milliseconds. Then its just a matter of connecting a studio light to an Odin receiver via the supplied sync cord, setting the Odin TCU to HSS, and the camera to a shutter speed over X-sync (1/1000th etc) and taking a test shot. The timing can then be adjusted to move the brightest section of light into the frame as it suits best. 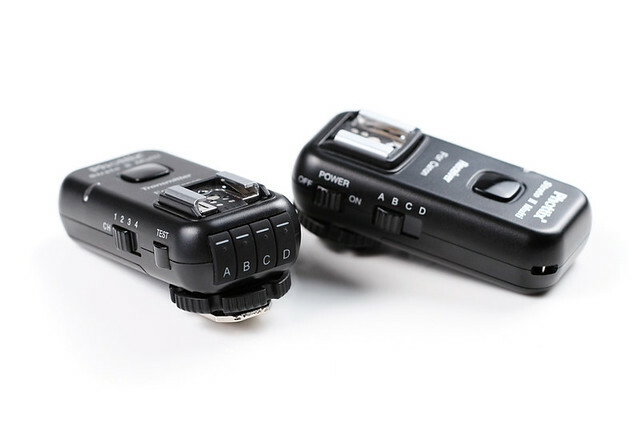 Full manual speedlites can also be mounted directly on the Odin receiver hotshoe, but full power is needed with speedlites. Power loss is similar to FP HSS, so larger monolights which have more power available are generally of more use here. Results will vary with lights and cameras used. Lights with a long flash duration are needed, and cameras with a small sensor and fast shutter give the best results. There is a more detailed explanation of Over Drive Sync here. Firmware updates load smoothly with no issues. It takes just a few minutes for each unit. There is no AF assist light on the Odin Transmitter. You can however put an ST-E2 on an Odin receiver and have that fire the AF assist light. Mounted above camera on a small flash bracket you have AF assist and Odin TCU on camera. That may sound less than ideal but at least there is an option. Its no easier to work around this with the PocketWizard AC3 either unfortunately, or the new Canon ST-E3 for that matter. UPDATE – AF assist is now possible with Mitros + flash used as the Odin transmitter on camera. This may be going a little beyond the Odins main intended purpose at this stage, but I have tried a flash mounted above the camera on a bracket and Odin receiver, and that functions just like the flash was mounted on camera. The AF assist light and zoom also work just as if the flash was on camera. The flash zoom can be set to auto for the flash above camera so that it follows the lense, and the other off camera flashes set to a separate manual zoom setting. The AF assist light needs to stay above the lens to be functional, so a bracket that keeps the flash upright in both landscape and portrait would be the ideal. You can get some inexpensive ones of those now, as well as very professional ones. The great thing about Phottix is that they supply all the cords you could need, and good quality ones. The Odin are fantastic triggers, Phottix have made a powerful system very simple and intuitive. Once you’ve experience how convenient they are its hard to go back. No more running back and forth, climbing lightstands, and digging in softboxes to change power settings again. Simplicity is the Odins strength, provided they fit within your needs the Odins come very highly recommended. Update – Over a number years now the Odins have still proven to be one of the most simple, reliable, and hassle free TTL systems available at any price! 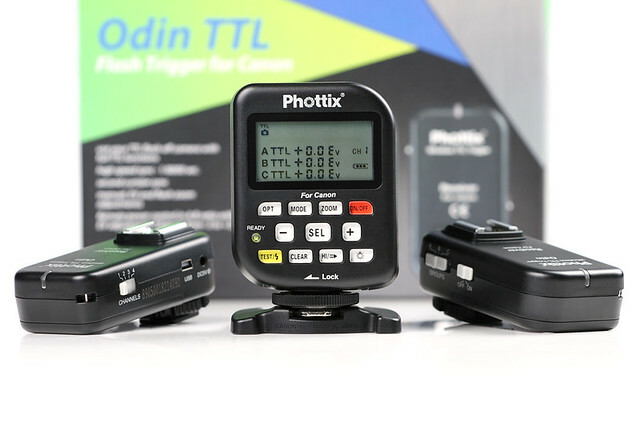 19 SEP 2013 – The Phottix Odin TTL triggers are now compatible with the Phottix Mitros + flash unit, which have Odin radio transceiver unit built directly into the flash. 22 Aug 2012 – Odin are now also Compatible with the newly released Phottix Atlas II long range manual triggers (transceivers). 21 Aug 2012 – CANON firmware update V1.20 – 1/3rd stop manual power adjustments for Canon Odin. Full compatibility with the 5D MKIII. Prices range from around $320 for the Tx & Rx set. See also the Phottix Mitros + flash unit, with Odin radio transceiver unit built-in. Great Review! Some of the best information I’ve come across yet. Thank you! But I have a couple questions. – Does High Speed Sync “Just Work” without cabling when using only speedlites? Shutter above 1/200 basically. – Could you do this using the strato II receivers? – Yes FP HSS works straight off the receiver hotshoe (so no cords required) as long as you have a compatible HSS enabled speedlite mounted. – No you can’t do FP HSS with Strato II receivers unfortunately as that requires the Odin TTL enabled receiver. But what is really cool is you can still do “OverSync” (thats my term as “HyperSync” is the PocketWizard trademark term) with the Strato II receiver, and therefore manual non TTL speedlights or monolights as well. And you can mix the FP HSS and on Odins and OverSync on Stratos at the same time. Note – OverSync results vary and depend on camera (small sensors are better than large), and lights used (long flash duarion is much better than short), and its not an official feature of the Odins (but can be a very handy one). 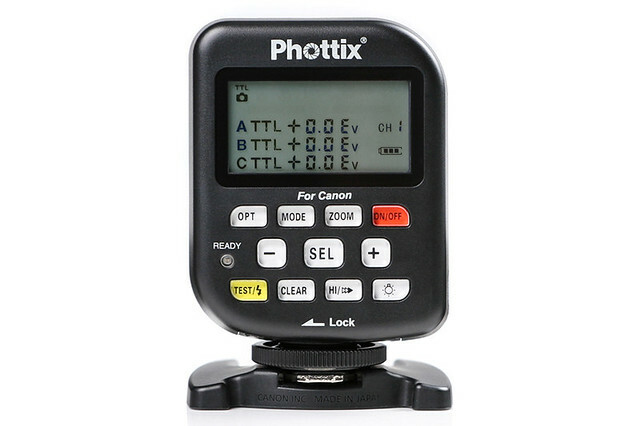 Phottix has now issued a firmware update that allows 1/3 manual power adjustments. You might want to update the review to reflect that. Plus, there is now a Nikon version available too which works very much the same way as the original Canon version except it has always allowed for 1/3 stop power adjustments in manual mode. Thanks Brian, I’ve been meaning to get to a number of updates. 1/3rd manual power adjustments is fantastic news, and another great advantage to this is that even older flash units like the 550ex, 430ex & 420ex which didn’t originaly have 1/3rd stop manual adjustment will also now have this feature when used with the Odins. I just purchased the Odin and 3 more receivers. I am using a 5DM2, 2 – 430EXs, 1 – 430EX II, and a 580 EX II. I am experiencing missed exposures on all of the receivers. This occurs when I shoot as slow as 1-2 frames every 2-5 seconds. I found changing the provided batteries with fresh rechargeable batteries helped for awhile and at one point I was able to shoot a burst of 8 frames without a missed exposure. I am only using two of the receivers and one is set to Group A and the other Group B. I have experienced missed fires in using ETTL, HSS mode and in normal mode. I found that in manual mode at an output of 1/128 all receivers fired without a misfire. I have recharged all the speedlight batteries to full charge thinking the problem might be the strobe recycle time. It wasn’t. My only conclusion is that the batteries in the receivers might not be able to keep up. I made a note that there is a 5V DC adapter on the receiver but no where is this listed as an accessory. Any thoughts on why this system isn’t performing flawlessly like those reviewed? Just for the sake of the testing I would use all fresh Alkaline batteries in both transmitter and receivers, good Duracell or Energiser. And be careful to make sure the transmitter is properly pushed all the way on the camera hostshoe (and likewise the flashes on receivers). Make sure your camera hotshoe and flash shoes/contacts are clean too. If you’re still getting consistent results at 1/128th, I would slowly up the power with the flash units right next to you so that you can see that they have clearly recycled before taking the next shot. If you’re still getting misfires then, theres probably not much more you can do other than to exchange them. Its worth sorting it out though because when working as they should the Odin are very trouble free, simple and reliable. Hi there, the YN-622c has some fantastic features for the price, but it’s limited by the functions of the Canon flash control menu, so it really doesn’t compare in terms of speed and ease of use through the user interface, or functions with non MkII flashes or cameras without the flash control menu. Has anyone confirmed that ODIN TTL system is compatible with the Canon 6D?. I own a PW flex/mini, and they have no clue how long it will take to to reverse engineer compatibility. This plus other known issues will probably result in my changing to either ODIN or Popper (with its own seperate set of issues). I had better check as but as far as I understand the protocol with the 6D is pretty much the same as the 5DIII. Will get back to you. Thanks. EDIT – Confirmed with Phottix , the Canon 6D is fully compatible with the Odin. Another PW user fed up with the time it is taking to get the 6D reverse engineered….do we know if the Odins play with the 6D yet? Sorry, yes the Odin is fully compatible with the Canon 6D. Thanks. Got the Odins this morning – mightily impressed. There’s something I’ve been trying to find out, but can’t seem to find the answer online. I use Nikon, Olympus and Fuji cameras. I currently have pocket wizards which are great but I would love being able to control my speedlights remotely. Is there anyone who knows if the following would be possible? Using Odins to control the flash output from my Nikon flashes remotely whilst the TCU is mounted in the hot shoe of an Olympus or Fuji camera and being triggered by just the centre pin (fine if I have to tape the other pins). Any help would be greatly appreciated. The short answer is unfortunately no. You can’t fire the Odins at all unless the transmitter has the full TTL contacts connected to the camera. The YongNuo YN-622N has a basic trigger mode, so they could control your flashes from the Nikon camera, and still work as a basic manual trigger (without and remote power control) on other cameras like your Olympus and Fuji. If you’re just after remote manual power control something like the Cheetah Flash may be the best current solution. The trigger there is just a single firing pin so it work on most cameras, and you still have fast remote manual power control. You can even hand hold the remote and use your PocketWizards to fire the flash. FP HSS is even possible off camera with when using the Nikon camera (NO TTL). The other one to possibly look out for is the inexpensive YN-560 III manual flash unit with radio receiver built in. Later in the year they should have a new transmitter unit which is likely to enable remote manual power control with the flashes. Provided you only need remote manual, these types of units are probably the best option across an number of cameras. Thanks. Do you know if Phottix has any plan to enable one pin triggering on the Odin Transmitter? The Pocket Wizard FlexTT5 allowed this and I was able to use my Olympus camera with full remote manual control of the flashes. I was able to seamlessly use 2 different cameras (Nikon and Olympus) with full independent manual controls. Since I have moved to the Odin I have lost that functionality. I’m not sure about this as it may not be simple to implement with the Odin, considering the flashes are in TTL all the time, and the power level is sent before each shot. I’m sure Phottix are aware of the popularity of mirrorless camera etc now, but you might want to contact them and let them know you would really like this feature. As the more people that request this the more they will know there is really a demand. Thanks. How about working this with the 600ex rt? I’m pretty sure there must be some conflicts as they are on the same frequency? There’s no issues with the 600EX-RT that I know of. Two, 600EX-RT on different channels are still on the same 2.4GHz frequency but don’t affect each other, as they are all encoded very specifically. Thanks. Hi, Just got them in .. And I guess I love them.. However, I have one biggish issue with them. As as I can tell there is no way to fire all channels at the same time. I am currently working with the strato I. I use the channels as different “Zones”. Main light is channel 1, rim light channel 2, etc etc. Then I use the easy channel switch to see the effect of the different lights. In the Odin I can not select ALL channels. Or can I? The all channels feature was pretty cool on the original Strato, I was a little surprised they dropped that on the II, but the group feature took over there giving more control (though a little slower in the scenario you mentioned). With the Odin the way you would need to do it is using the groups again, you have to run through and turn the 2 groups off that you don’t want, and leave the one you want on. Then flip them all on for the combined effect. Definitely slower than the simple switch but you can get pretty quick at it. Fantastic work here by the way – http://www.sanderbaks.com/ Thanks. Yea, I figured that much for my new working style. I guess i have to get used to it. But i just shot a running fan, and froze all motion with studio strobes at 1/8000th. Wow!!! Thanks for taking the time to test this product and write this detailed review. I am looking to buy in to this product but my only bug bear is the issue with the inability to use a light meter when triggering the flash in manual mode. Any idea if this issue will be rectified at some stage via a firmware update? Otherwise, this system ticks all the boxes for me. Update – from August 2013 firmware updates have allowed for light meter use with the Odin Test fire button. Thanks. Yes, I am a Canon 5DII shooter. I recently bought the pocket wizard Plus III which is a great flash trigger system, but of course limited to camera sync speed. So I want to purchase additional radio system that allows me to enter the world of HSS. As widely reported, the Pocket Wizard for Canon system is not the most reliable (TT1/Flex5) and the Canon 600ex system is pretty pricey especially with the possible need to upgrade camera body to take advantage of HSS etc. thanks again, will check out your next review on the Pixel King Pro. Don’t worry I’m busy beavering away on an ODS overview and Odin updates at the moment. Thanks again. Another person checked with Phottix customer service, and I think they quoted around November for the Nikon firmware update for light meter use. So at least we know they are working on it. I think the only work around I have heard of is using the camera shutter to trigger the lights, but using a long exposure with second curtain sync so that the pre-flashes go off well before the main lights. I don’t think that would be particularly practical though for regular light meter use unfortunately. Thanks. I have many Canon compatible flashes, and I would like to move to a sony camera. I don’t care for TTL, but for controlling manual ratio in groups. Can any of the units with ability to set things on the transmitter work with canon flashes on a sony body? I’ve actually been meaning to check this now that the Odin has new firmware, as does PocketWizard and the Pixel King Pro. I don’t have a Sony camera, but I’ll tape over the TTL contacts and test this with the Odin and King Pro and get back to you. I’d have to check with PocketWizard there to be sure, but I know you can change power levels now with the AC3 off the camera hotshoe, so I think that should work. Thanks. I tested this with the Phottix Odin, and the Pixel King Pro, both with the latest firmware. But unfortunately neither will fire the flash if connected by a single firing pin, or via a PC sync cord to the camera sync port. So no luck there unfortunately. That’s really a shame because you can hold the transmitters in hand and change power levels, and fire the flashes at the correct power level for light meter reading. So it really seems to be an oversight that they won’t fire from the camera firing pin instead of the test fire button. I will have to ask PocketWizard if there is any more luck there, but they could well be the same situation. One option I’m fairly sure would work though is the Radiopopper JrX. The they don’t have an LCD and 1/3rd stop graduations though, just simple dial for each group. Also possibly worth considering are the manual flashes with radio built in. The YN-560 III would cost less than the radiopopper triggers (though the transmitter is still not available as yet). The Godox V850 should be available soon and is looking very impressive. Thanks. Unfortunately I got the Phottix Odin and found that it only triggered my Metz (for Canon) flashes around 7 out of 10 frames. For 3 out of 10 shots the flash fires, but at very low power, and not synced with the shutter so no flash exposure at all, only ambient. Looks like I’ll have to change to the Pixel King Pro system, which it says on their Facebook page is compatible with my flashes. Pity, because I really like the Odin’s simple user interface, and the Pixel King’s seems a little less efficient. Does anyone have any similar experience? Do the Phottix Odin’s trigger the Elinchrom Skyport enabled monolights? I can’t find any details on this. The Odins are not directly compatible with the Skyport receivers. They should still trigger the flash as any basic manual trigger would, with an Odin receiver attached to the flash via PC sync cord. Thats just basic triggering like a manual trigger. Though the ODS may be of some value for higher sync speeds. Thanks. I use them, they are amazing. Does someone have information are they compatible with ettl Yongnuo flashes? Sorry no the Odin are not compatible with the YongNuo ETTL flashes. Best to stick with Canon, Phottix Mitros/Mitros+, or possibly the Nissin Di866 II. Thanks. Thanks. Could you advice me some good flash with ettl for Canon? i have 580 ex II but i change in this lamp 4 times a flash bulb I think about Nissin mg8000 did You used it? Sorry no I haven’t used the Nissin MG8000. But if you’re burning out the 580EX II that badly the MG8000 likely is your only option with the Odin. Its basically the same body as the DI866 II, so it should work with the Odin. The only other option is to move to larger bare bulb lights like the Cheetah/Witstro, or Quantum if you still need TTL. The Odin will fire the Cheetah/Witsto and allow HSS, but you still need the Godox triggers as well for remote manual power control. Thanks. Does anyone know if these can adjust ODS (Hypersync) timings per group? I need something that can adjust for each specific light when I’m working with dissimilar strobes. Will HSS and ODS work with older triggers like the original Strato? Sorry no the Odin only have a global pre-syn timing adjustment at this point. 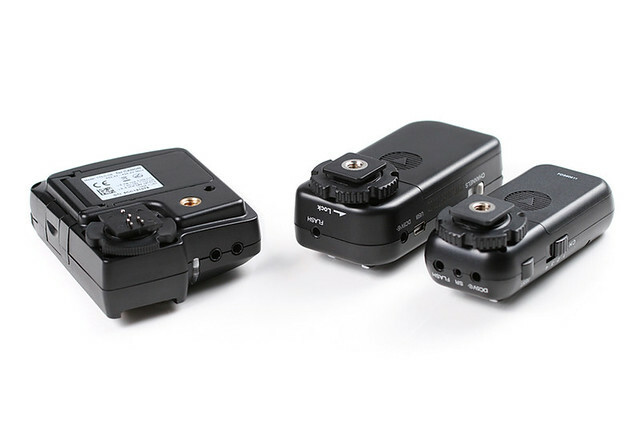 PocketWizard TT1/TT5 can be adjusted individually through each receiver, and the coming YN-622-TX is meant to have pre-sync timing adjustment via group. Yes ODS will work with manual triggers like the Strato II and Atlas II (with Odin as the transmitter). I haven’t tried the original Strato, but I think they should be much the same as the Strato II in this respect. Thanks. Quick question that I have and hope someone can confirm for me….thanks in advance. I just did the Odin TCU (1.5) Canon firmware update to V2.03 and noticed when I press the “test” button to fire the flash (Mitros+), there is about a 3-4 second delay before the flash fires. Is this normal? I don’t recall that being the case before I updated the firmware, I remember the “test” button being instant for the test flash. Yes the delay is meant to be like that. It was added so that you can take light meter readings. The pre flash goes off first, and then a few seconds later the flash will fire at the correct power level so that the main flash output can be read with a light meter. That is mentioned in the firmware release under “Test Fire and Light Meters”. I forgot to follow up to the last question above….with the new “test flash” function, I really can’t see any low-power pre-flash followed by the normal flash 2.5 sec. later. Can you visually see this pre-flash? I have re-checked all my TCU settings and Mitros+ settings and they are both indeed set to “M”. Of course the Mitros+ is in Odin RX mode, this should not make a difference correct? Yes you can see the low power pre-flash really easily if its there. Which makes me think maybe the Mitros+ is not doing the pre-flash on test fire then. We had some false hope for a while that the Mitros+ for Nikon was not doing the pre-flash at all in manual, but that was debunked already. I’m not sure about the test fire pre-flash now though. I have a Mitros+ on the way, and will check this as soon as it arrives. With Phottix having full control of the Mitros+ flash now (as apposed to trying to make a Canon 600EX-RT etc do what it doesn’t want to) I can’t see why they couldn’t remove the pre-flash all together. So its likely they may well have just removed the pre-flash from the Mitros+ test fire. If other flashes on Odin receivers where included, they would likely still pre-flash though. This is interesting, the V2.03 firmware release notes still mention that when pressing the test button on the TCU, this will fire a pre-flash on the flashes when set to “M”. You are correct as it does not mention which flash acts like this, the original Mitros or the Mitros+? At this point, I suppose you’re on to something when you mention Phottix may have just removed this function totally. Please post an update as you test the Mitros+, P.S. you’ll love the flash! Good news, I tried this with the Canon version Mitros+ and Odin transmitter, and Phottix have indeed removed the pre-flash altogether when using remote manual power settings with the Mitros+. So a light meter or optic slaved flashes (in S1 mode) can be used at the same time as the Mitros+ in remote manual use. The delay is there in the on the test fire button so when using other TTL flashes and Odin receivers as well (which still pre-flash), that their pre-flash is still separated for light meter use. Thanks, yes the Mitors+ interface is great, much quicker than the Odin transmitter. I’m working through testing all the recycle times etc now. I just got my first odin/mitros+. i’m already looking to expand but i was hoping that i would be able to so with extra odin/strato receivers and yongnuo flashes (yn-568ex ii specifically). you have them listed as incompatible in ettl mode. is this from your testing or from flash havoc users? i’m just curious as to what technical reason a ttl flash wouldn’t work with a ttl receiver. That is from my own testing and others have confirmed the same result. Though with the Nikon version Odin some people have reported the YongNuo flashes working (I’d still be wary of that combination though). Its likely more common than not that third party TTL flash and different brand third party TTL triggers don’t work completely together. This is because the third party brands need to reverse engineer the Canon or Nikon etc TTL protocols. Its hard enough making gear compatible with the genuine Canon (or Nikon etc) cameras and flashes, and Canon (or Nikon etc) try to make that harder with each new camera etc they release. So all the third party units may not match the original Canon etc protocols exactly, and therefore they can all have slightly different protocols which are not completely compatible with each other. Full compatibility with the original brand is the main priority, and that can be hard enough to achieve. The YongNuo TTL triggers like the YN-622C likely follow the Canon protocol most closely, but the YongNuo TTL flashes were designed earlier by a different engineer, and likely least follow the original Canon protocols. Though both being from the same company, they can at least ensure they will be fully compatible with each other. YongNuo flashes are fine on Phottix Strato II manual receivers though. But they won’t work on the Strato II TTL pass through hotshoe mounted on the camera. For control through the Odin system though, sticking with Mitros+ would be the best option. Unless you have existing Canon flashes, then its worth adding Odin receivers. Maybe just keep a look out for some good prices, the Scott Kelby kit is a great constantly running deal for example. I’m a happy user of the Odin for triggering my speedlights in interior architecture work. I find them much more reliable than the PW TT5s which often embarrassed me in front of clients. One issue I am having though is using them to trigger older style Elinchrom monoblocs – the ones with the proprietary sync connector (Amphenol?). I had assumed this would work when I purchased them, as I thought it would just send a dumb ‘fire’ signal, however it isn’t working. Well, it has worked once or twice but seems to need the cables removed and the receiver powered off and on to fire again. I’m not that familiar with the Elinchrom lights, so likely not a lot of help here. I haven’t heard of any issues with Elinchrom lights and the Odins previously. It may be completely irrelevant, but one person mentioned something similar recently using the YongNuo YN-622N TTL triggers. And what worked there was to place a TTL flash on the receiver first, and have that firing correctly. Then remove the TTL flash and connect the Elinchrom via sync cord. And they would then keep firing until the receiver is switched off. That may not work with the Odin, but its worth a try just in case. The only other things I can mention is that the Phottix Strato II and Atlas II manual triggers are also compatible with the Odin as receivers. So I don’t know if those manual receivers may possibly be more friendly with the Elinchrom lights. Otherwise it sounds strange that it worked a few times and then not again. Maybe this is an issue with the FlashZebra adapter, or the way the Phottix sync cord is mating with the adapter. It may be worth asking Lon from FlashZebra if he has heard of anything like this issue previously, as he is very helpful. Thanks. Some further info. Some time ago I modded my 580EX IIs to have a 3.5mm port rather than the PC sync socket. This worked fine with my PWs previously. Following the Elinchrom problems I tried firing the 580s via a cord from the Odins. No go. Tried 3 receivers. I then plugged in a Nikon SB-28 via a cord from the Odin to the PC socket on the Nikon. Fired every time. Weird. I’ll try your suggestions and investigate further. I don’t need to fire the Elinchroms remotely very often, but I do need it occasionally and it has to be reliable. The PWs were, but they sucked with the 580s etc. Is it mixing Canon and Nikon flashes possible with the Odin? Or are the Canon and Nikon versions incompatible with each other? I wonder how the Cactus V6 stacks up against the Odin, will you have a chance to look at the V6 sometime soon? I personally cannot use the Odin on my camera, but I have buddies shooting Canon that wonder about Odin vs V6. I realise that the V6 does not support any TTL via radio (only pass-through on camera) but it may have other advantages, such as being brand-agnostic (all sorts of flashes for the Canon, Nikon, and Pentax flash systems are supported), four groups, light metering?, simultaneous power change?, …? Knowing the updated firmware allows for 1/3 ev changes, and the new Odin was changed to display it on the screen … then how do you know where you are at when you make these changes on the original version. Is noted on the screen at all? Yes the 1/3rd stops are still displayed on the original Odin Screen. They just had to work around what was available on the original display to do that. Thanks. I have a Nikon D90 and i just purchased Scott Kelby Mitros+ TTL Flash and Odin TCU TTL Flash Trigger. My first trigger and remote flash. I have been trying to get the flash to work through the trigger and just wanted to know if there are any little tricks or settings that may be obvious but I am missing. I have read the manuals and researched allot but I don’t know if it is necessary to “pair” the flash to the trigger ? or should the flash up the signal from the trigger all on its own? No there’s no need to pair the units. Just make sure they are on the same channel and group. Set the Mitros+ to Odin RX mode, and that’s about all there is to it. The flash should pick up the signal from the Odin transmitter as soon as you half press the camera shutter. Or even press the test fire button on transmitter when its off the camera hotshoe. Thanks. I picked up two mitros+ and an Odin transceiver. I’ve found three issues which I simply cannot understand (why these would ever be produced like this in the first place). Please let me know if there is a solution for any of these. – pre-flash occurs even when using flash in Manual by remote. I read above, that this issue was fixed.. I downloaded the latest firmware,, yet I still cannot fire other manual slaves in proper sync when in S1 mode. – focus assist beam seems to fire even when the flash is off camera. This is not only useless but highly irritating to client (imagine a wedding where flashes are shooting red laser beams all the time)…. Is there no way to turn this off.. It’s useless when off camera anyway. – red “ready” light.. blinks on/off constantly when the speedlight is off camera. This is not a very useful feature and even if it were, I should be able to turn it off. Again it’s irritating to clients to have a cylon blinking at them all the time for no reason. Seems to me Phottix doesn’t give a hoot about “real world” use. These are three things that should have been clear to them long before they went to market. You will find many systems do all of the same things. Its not something I like either, but its easily fixed with a small piece off Gaffa tape over the LED panel on the front of the flash. I’m not familiar enough with Nikon to know if that can be turned off at all. Regarding the pre-flash, again at least Phottix have made some progress removing some pre-flashes with the Mitros+ (at least in the Canon version I have), where as I don’t think any other Nikon compatible systems have. Again I’m not that familiar with the Nikon system. You can easily attach a $50 Strato II receiver to any studio flash that doesn’t have an S2 mode. There were other much more concerning issues with recycle times etc. Hopefully the fact that you didn’t mention any of those means there may have been some decent improvements in the latest firmware. I am considering buying the Phottix Odin ETTL kit, any suggestions on a additional speed light. I currently have a Nikon SB700 and I am looking at getting another Nikon Flash or something more powerful than this but just to make sure there is not a compatibility issues. Thanks for the review on this product. With the Odin you would be best to stick with Nikon flashes or the Phottix Mitros. The Mitros is probably not much more power than the SB700 though, so you would be best to look to an SB-800, SB-900, or SB-910. The Nissin Di866 II is one third party flash that does work fine with the Canon version Odin, though I’m not really sure about the Nikon version now. Are these still not compatible with yongnuo flashes for remote power control? I think there was some mention of the Nikon versions working to some degree. In general its doubtful the older YongNuo flashes (YN-568EX II and back) will ever be particularly compatible with the Phottix system, because YongNuo did not follow the Canon protocol very closely with their flashes. The YN600EX-RT may be a different story though, I haven’t really tested that with an Odin receiver as yet. Quick question, can I use the Odin on top of a stratos ll??? I haven’t tested this though it should work, as people quite often also use the Canon ST-E3-RT on top of the Strato II pass through hotshoe. Do you realize the Odin transmitter will fire the Strato II receivers though? The new Odin II transmitter will have 5 groups as well, so the only reason then I could think of to use both transmitters would be if you possibly needed more range with some manual flashes in the mix. Will be using on Nikon d610 & d750’s, we shoot a lot of weddings…during the event we use our SB 910’s for ttl fill on camera (sometimes main) and my understanding is that the stratos ll will allow our backlight/kicker lights to fire on manual, this is good. I was just wondering if we placed the Odin on top of the stratos ll on camera if that would allow the stratos receivers (already set up) to work TTL? No the Strato II can not do TTL at all. You can use the Odin transmitter to fire Strato II receivers, though in manual only. The Odin transmitter can fire and control Odin TTL receivers at the same time with TTL. So you could use your SB910 TTL flash on top of a Strato II transmitter on camera. And when you want to take the SB910 off camera just use an Odin transmitter on the camera to fire both the Strato II receivers (in manual) and your SB910 (in TTL or remote manual) on an Odin receiver. Currently using Phottix Strato II and they are useless outdoors at anything over 20-30 meters. What sort of range could I expect from the Odin (outside, say on a football field)? Something is very wrong there, as the Strato II will generally easily reach 100 meters clear line of sight on a football field etc. Are you using new alkaline Duracell or Energizer batteries in them? If you needed more range in a manual trigger the Atlas II will provide that, and they are compatible with the Strato II as well. The Odin being full TTL triggers do not have as good range, approximately 25 to 30 meters is around the reliable working distance. They can reach 60 to 100 meters clear line of sight, though with a multiple flash set up you can start to get misfires working beyond around 30 meters. That’s similar with the YN-622C or Canon RT system etc. I use NiMh batteries and these are always charged before each use. I just tested in a different location(suburban street) and on a different channel(3) and got about 100m range. When I was using these on a job two nights ago, I was photographing a building out in the open and on channel 4. Perhaps something in the building was interfering with the signal? Yes interference with lots of things like wifi etc can be a problem, though the Strato are generally pretty solid. Changing the channel is always worth trying though if you’re having issues. I don’t know if you’re referring to manual PocketWizards or TT1/TT5, though the situation is not much different with the TTL triggers, and if anything PocketWizards Control TL have a lot more complaints with this. The Atlas II are more in comparison to the Plus III / X for manual trigger range. NiHM batteries even when fully charged have a lower voltage than Alkaline. If you’re having any issue the first thing I would do is use good Alkaline instead. This is actually something that solved a lot of peoples issues with the PocketWizard TT1/TT5. How do you turn off the preflash in the Indra 500’s for Nikon?? What is it for?? It makes my subjects blink in every shot! I photograph sports teams with 3 year olds being the youngest and all the blinks I’m getting are highly irritating! I need the flash to fire when I push the button, not 3/4’s of a second later. PLEASE HELP! PS: I downloaded the 1.06 firmware update and nothing changed. So you are in manual mode on the Odin? I know the Mitros+ emits a pre-flash for manual which is messing up my metering. I am now curious does it do the same on my Indra in manual? I bought the nikon version yesterday and I am using Nissin Di866 Professional(is this same as mark1?). TTL and Manual controls works fine. I can adjust TTL EV values and Manual flash output via the commander. Note that my flash unit was bought as stock and I did not update the firmware. I was about to but the Phottix Mitros and since Odin works fine on my Di866, I was able to same some money. No, you would need an Odin receiver attached to the 600EX-RT. Just an update with me using Nissin Di866 professional. It seems to work ok as long as I’m not using HSS. Anyway, it is only compatible with the Mark 2 version. Other than that, I can still control remotely the TTL EV and manual power controls. But when I did use Mitros+ as a Transmitter to fire HVL56, I had no issues. Updating software did not help. Great review, thank you. I have 1 stratos ll transmitter and 2 stratos II receivers, all for Nikon. I use the receivers on an SB 700 speedlight and an Alien Bee studio light, all in manual mode as that is the limitation with this transmitter. Would be a nice benefit if I could set the power of these lights from an upgrade transmitter like the Odin. Do you know if I would be able to do this using my existing Stratos II receivers? It’s not clear to me what Stratos II compatibility means. And if yes, would this also apply to the Studio light? Doubt I would make the jump if I would need all new receivers to gain this remote control capability. If you contact your local distributor, or if you don’t know them contact Phottix directly, and they should be able to help you out with sourcing a new foot. They base assembly just screws on. Is the original Odin trigger 100% compatible with the Indra 300/500? You may be best to check directly with Phottix on that. The thing is Phottix are moving to the Odin Z operating system, and there is no mention of what compatibility that leaves with the original Odin mark one triggers. If its just a transmitter you’re talking about (and you’re not owning a bunch of original ODIN receivers etc) it almost surely best to just upgrade to the Odin II transmitter.